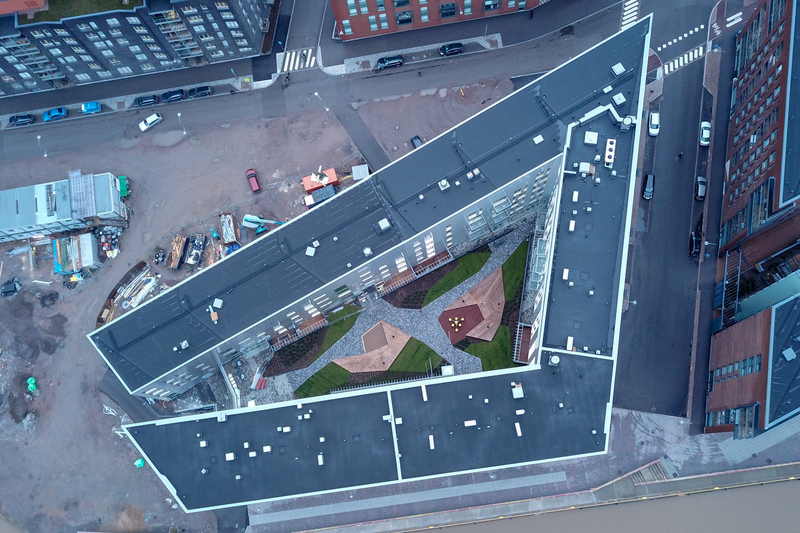 In the above photograph you have an overview of the whole Kalasatama area which is a part of the district Sörnäinen. 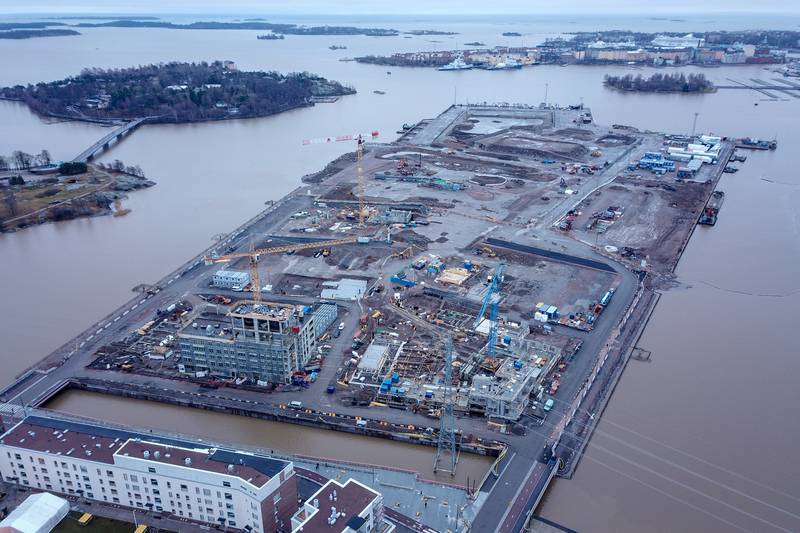 In the foreground you have the rather new buildings of Kalasatama. 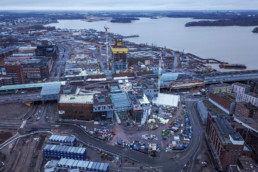 On the right hand side is in the words of REDI’s own site (the name of the complexe) the “experiential shopping centre” being built, a residential tower can already be discerned by its yellow top ribbon. 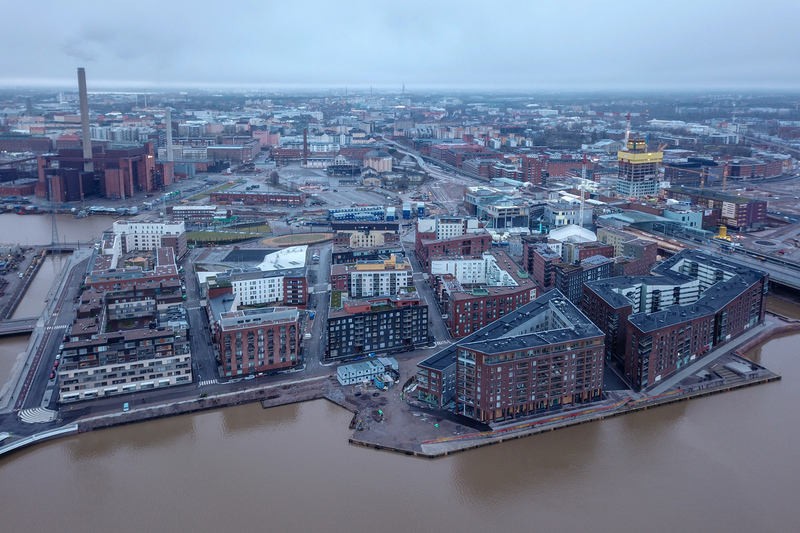 Between REDI and the newly erected houses of Kalasatama the metro line and the feeder connect the city with East-Helsinki. 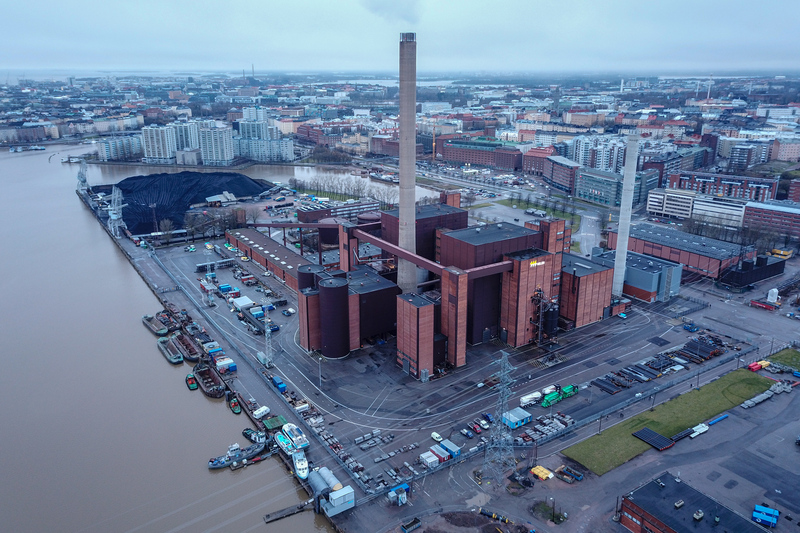 On the left hand side the power plant Hanasaari is sticking out its chimney and in the centre you have an area called Suvilahti. The following photographs have been taken during a stroll through the neighbourhood Kalasatama, Helsinki 6.1.2018. 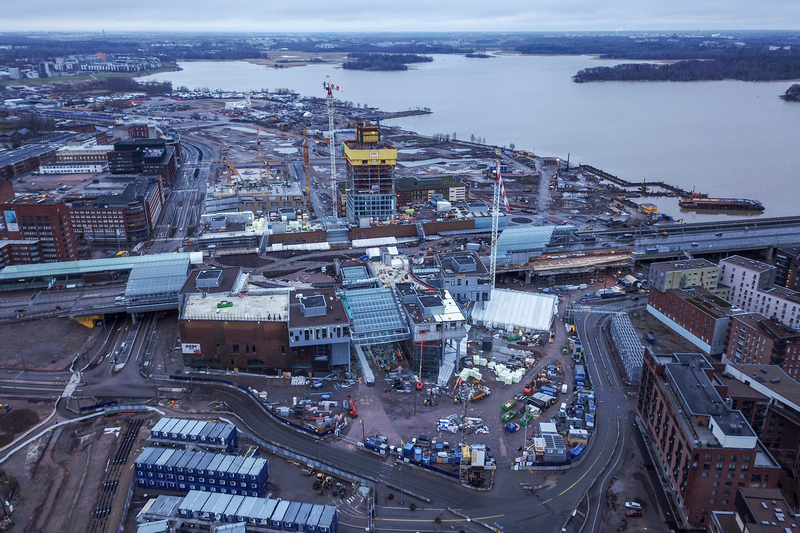 Below REDI in the centre being built around the metro station Kalasatama and behind REDI the city’s brand new health station. Below a detail of Sompasaari a former harbour and port of Helsinki now being rebuilt into a residential area. 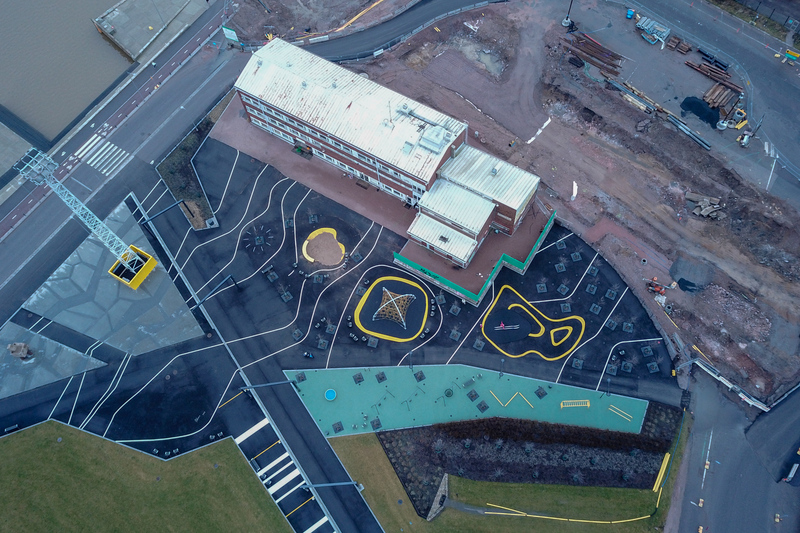 Here’s a bird’s eye view of the playground Kalasataman puisto. 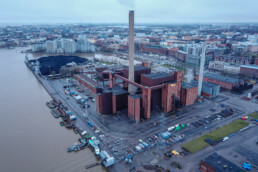 The power plant Hanasaari and the coal reservoir – a part of Sörnäinen (district). Behind the reservoir, just opposite the canal is Merihaka (neighbourhood). In the background on the left hand side you can see the chimneys on Salmisaari (neighbourhood) and most of downtown Helsinki. To the right you have the uptown all the way to the Olympic stadium at. 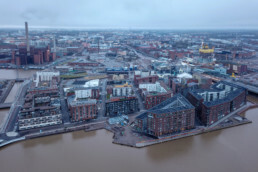 The two islands in the front are popular recreational areas. 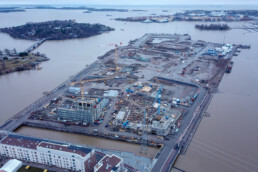 On the right side is Korkeasaari the zoo and to its left is Mustikkamaa popular due to its many outdoor activities. The white bridge Isoisänsilta (grandfather’s bridge) connects Mustikkamaa with Kalasatama. Kalasatama viewed from the Mustikkamaa side, towards east. 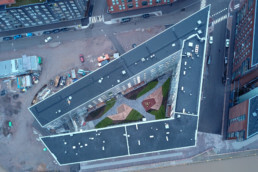 A detail view of one of the sea side buildings of Kalasatama. The same photos again now uncropped. Clicking a photograph will open it into lightbox view.